All Saints Milton have been hosting a Women's Day each year now for 10 years! To mark this milestone, we believe it would be good for the women in our church who have worked so hard serving others to have an Oasis Day this year where they can be refreshed and built up. We realise that this will disappoint many of you who have enjoyed and been so blessed at our Women's Days, but we also recognise the importance of receiving from God, and allowing our team to be refreshed together. Please do pray for us during this year of refreshment, and as we seek God's leading for 2017. We will miss seeing you all this year, but look forward with anticipation to what God has in store for us all in future years. 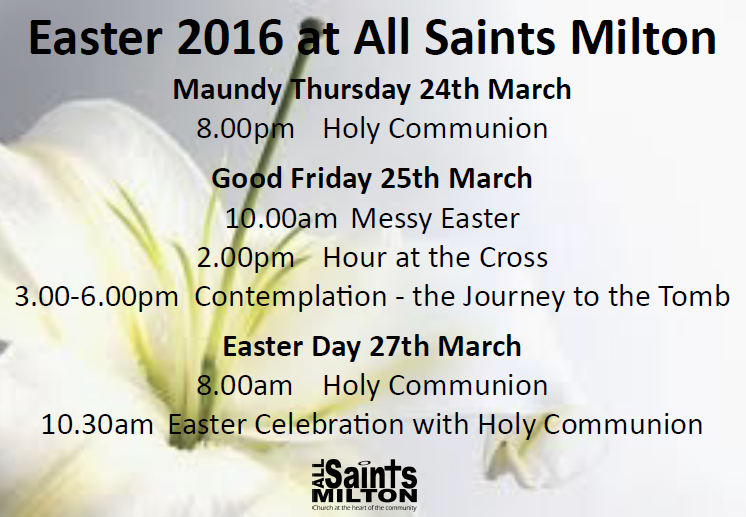 With love and blessings from all the team at All Saints Milton. Recordings of the sessions from previous years are available at the 'Recordings' tab in the menu above. If you are new to All Saints Milton (or have been part of the church for some time) and would like to be on the Church Electoral Roll, allowing you to vote in the Annual Parochial Church Meeting on 17 April 2016, then please pick up an application form from the table in the foyer. Completed forms should be returned to Pearl in the church office, or left in the office box in the foyer. Please consider gift aiding your donation. All Saints’ Milton is a UK registered charity (No. 1142388), so if you are a UK taxpayer we can claim an extra 25p for every £1 you donate. An opportunity to rest, relax, reconnect and refuel in beautiful surroundings. Cost £20 including two course lunch and refreshments.